On Tuesday the 25 April, Barrow Farm hosted nearly 70 coaches and volunteers from around Essex and Suffolk at a training day titled: Towards Independence. The session aimed to help volunteers support riders to encourage more independence in all aspects of their riding. This is important as it allows the rider to reach their own potential but also can encourage the rider to become more independent when they are not on the horse. The day started with a session on the position of the rider and what holds you might need to support the rider and how these change as the rider progresses. The session run by local physiotherapist, Louise, also looked at how novice riders loose their balance especially around corners or in transitions. There was then time to reflect on this learning as the delegates watched our regular Tuesday morning ride in progress. There was plenty of time for discussion over lunch before the afternoon was spent taking part in three workshops. 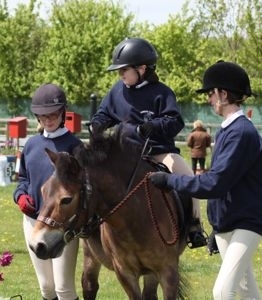 Each workshop focussed on a different RDA discipline, Countryside Challenge, Dressage and Showjumping and worked on developing the volunteers leading and support skills that would allow the rider to become more independent. The day proved very popular and hopefully all of the participants learnt something that they could take back to their riders in groups across the southern part of our region.